Some years ago, Sony Classical re-released both of the Canadian pianist Glenn Gould’s recordings of J. S. Bach’s Goldberg Variations (BWV 988) on a three-CD set. Along with remastered discs of Gould’s classic 1955 performance and his valedictory rendition of 1981, the reissue’s producers added some out-takes from the earlier recording sessions, including an interesting exchange that took place when it came time for Gould to record the last of the thirty variations, the famous quodlibet incorporating popular German songs of Bach’s day. The twenty-two-year-old pianist whimsically demonstrated an interesting musical relationship between the British national anthem, “God Save the King” (known in the US as “My Country ’Tis of Thee”), and that of the UK’s former colony, “The Star Spangled Banner.” This July 4—239 years after the two nations parted ways and sixty years after Gould entered Columbia Records’ 30th St. studio in New York City—let’s take a look at what he discovered. Gould then proceeds to play. Just as he describes, Gould begins his quodlibet midway through “God Save the King,” playing it in G major in the upper voice with octave doublings. He brings in “The Star-Spangled Banner” in an inner voice on the third beat of bar 6 with a pick-up to the penultimate measure of “God Save the King,” which begins over in bar 9. At m. 15 he continues into the second half of “The Star-Spangled Banner” without the customary repeat of its first half. 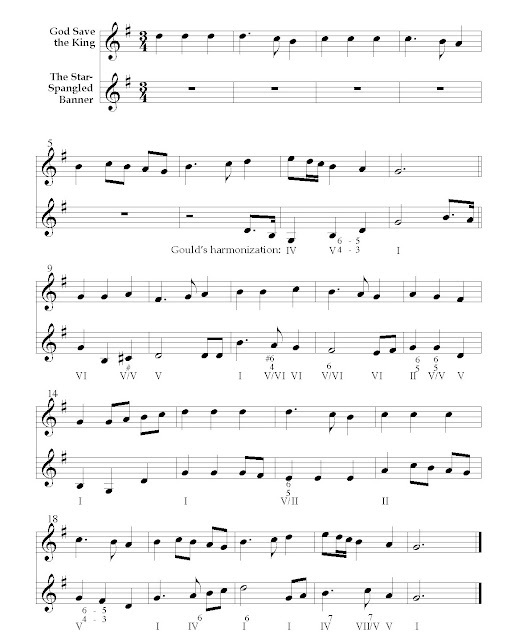 For the most part, the anthems are harmonically compatible when so aligned; the example below isolates their melodies from the full keyboard texture and provides Roman numeral and figured-bass indications corresponding to Gould’s harmonization. In five places, one of the melodies receives a non-standard harmonization so as to conform with the other. The first reharmonization is at m. 9, where Gould supports the opening bar of “God Save the King” with an E-minor chord (VI), rather than the usual tonic, G major; the E♮ in the bass, from the third measure of “The Star-Spangled Banner,” takes precedence in determining the harmony. Then, at m. 12, he uses a secondary dominant, chord, B-major (V of VI), to harmonize the F♯ in “The Star-Spangled Banner,” whose more orthodox setting would be a dominant harmony; here the melodic B♮ in “God Save the King” takes precedence. 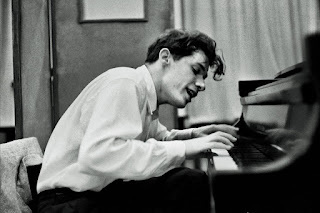 In the next bar, m. 13, where the third line of “God Save the King” ordinarily has a pre-dominant supertonic harmony on beat 1, Gould plays II 6-5. 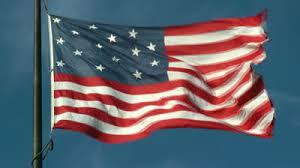 This again reharmonizes “The Star-Spangled Banner,” which conventionally uses a tonic harmony at this point. Three bars later, at mm. 16–17, Gould tonicizes A minor by means of its dominant, an E-seventh chord. This “modulat[ion] to the supertonic region,” as he calls it, arises because, on the downbeat of m. 16, the note D♮ in “God Save the King” coincides with E♮ in “The Star-Spangled Banner”—a dominant seventh on E is the most logical harmonization since it contains both of these pitches. The former melody is often supported by a tonic harmony at this point (see, for instance, m. 8 of Beethoven’s Seven Variations on “God Save the King” (WoO 78)), while the latter usually uses the subdominant. 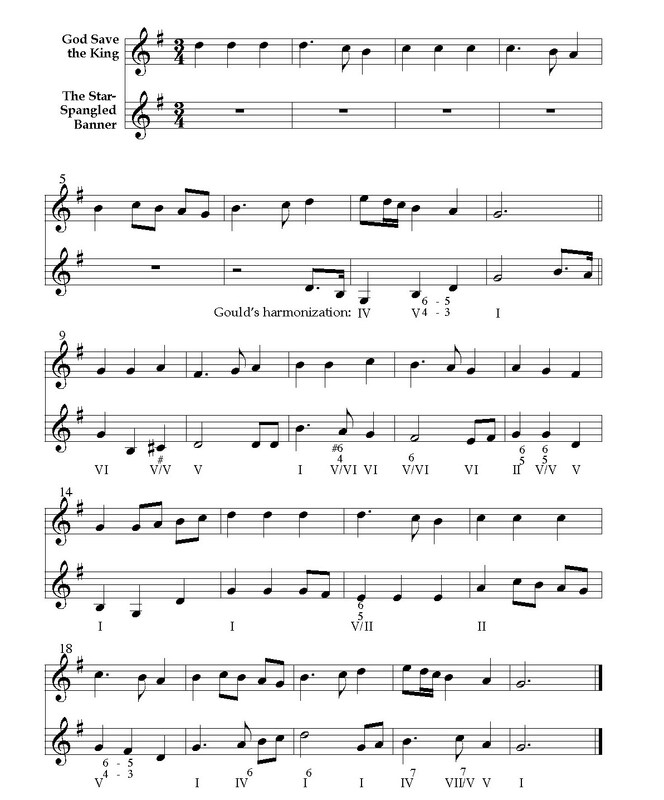 Gould’s final non-standard harmonization occurs in bar 21, the next-to-last measure of both anthems, where “God Save the King” contains an E♮ on the downbeat while “The Star-Spangled Banner” has a B♮ that would ordinarily be supported by a cadential V6-4 harmony. Here, “God Save the King” takes precedence—the pianist plays a subdominant major-seventh harmony in root position. Rather than progressing directly to V on the next beat, he interpolates VII7 of V before arriving on the dominant on beat three. This results in an ambiguous treatment of the subdominant scale degree on the fourth eighth note of the bar, where a C♮ escape tone in “The Star-Spangled Banner” occurs simultaneously with the bass-note C♯. The two anthems fit together quite well, mutatis mutandis, because of their similar harmonic foundations. How did Gould happen across this apparent coincidence? Maybe he noticed that the beginnings of both melodies’ second halves are clearly suited to a I-VI-II-V-I harmonic progression and then he extrapolated backward, realizing that their first halves—whose similarity is less self-evident—can also be superimposed. 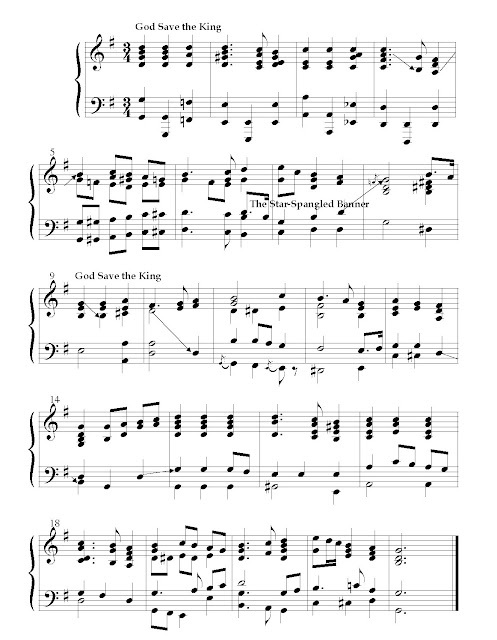 When the melodies are combined in this way, “The Star Spangled Banner” will end up starting two measures before “God Save the King” because the American anthem’s first half is eight bars long whereas the British anthem’s is only six. Benjamin Givan is Associate Professor of Music at Skidmore College. He is author of The Music of Django Reinhardt (U. Michigan Press, 2010).